Is icloud drive also used to sync between devices? If so, are the files automatically deleted from iCloud once the devices are synced? iCloud Drive can sync between devices if those devices are set up to do so. Importantly, the iCloud Drive on your Mac stays there so, if you copy data from your Mac to iCloud Drive in order to store or sync data, you will end up with twice the storage space being used on your Mac – original on Mac and copy in iCloud Drive Folder. I’m wondering if there is a user anywhere who can tell me how using the iCloud can make my computer easier, more efficient, safer, or more valuable in any way? Thanx. I am new to MAC’s and have been totally upset by the whole ICLOUD “thingy”. I did *NOTHING* when I got my IMAC. no customizations to say I wanted to use ICLOUD. In fact, I have received several messages saying that the ICLOUD was either down or unavailable. So I steered away from even using it. Must to my surprise that I got a message saying that my ICLOUD wasn’t big enough. Since I wasn’t using it I was troubled as I thought the message was in error. To make a long story short I found some files in the ICLOUD that somehow mysteriously (I don’t know what it is so I can’t use it)gotten there. I deleted them and found a place where I could disable it (the cloud) and when I unchecked the ICAL, I found out that I could no longer make appointments in ICAL. Apple has made a big mistake in this. I will not be forced into buying additional “hardware” that I do not want or need by some hidden APPLE process that doesn’t let you know what is going on. You really are quite the crybaby! … and yet, even crybabies sometimes make good points, as in this case. You probably had enabled iCloud Desktop & Documents Folders and/or ‘Optimize Mac Storage’, which Sierra defaults to want to use, and it starts uploading your desktop and documents into iCloud which is sometimes very confusing for many users and often quickly hits the iCloud storage limit and they have no idea the files are going up to iCloud servers. Then, to make matters even more bizarre, if they delete or disable iCloud, they might lose the files, or might not, depending on how they handle it. It is confusing, I know even advanced users that can’t explain it. I also know a former “Mac Genius” who relied on iCloud Photos and then lost an entire library of their photos…. if an ex-Apple “Genius” can’t figure it out who can? If you want cloud file management, I personally recommend Dropbox. It’s much easier to use and understand. The whole paragraph starting with “Remember, any file or item dropped into iCloud Drive will move that file into iCloud Drive and away from the local Mac storage.” is incorrect at least from OS X 10.11 and upwards–I don’t remember how 10.10 worked. The files are stored locally and uploaded. From a user perspective, I’d say exactly like Dropbox; however, I’m sure the mechanisms vary. 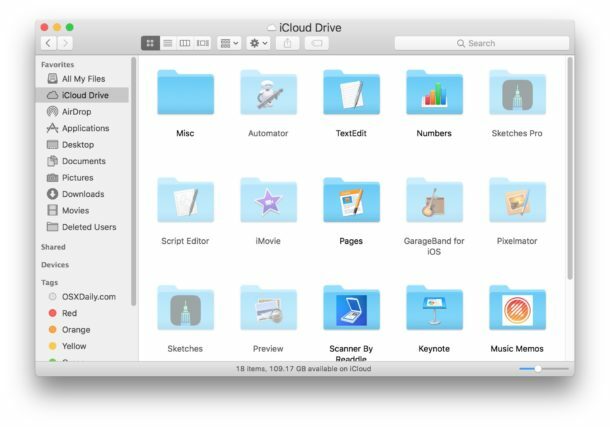 If you drop a file into iCloud Drive, it moves it from the Mac local storage into iCloud. That’s how it works in Sierra, High Sierra, etc. The description is correct. Traditionally, dragging and dropping a file from one drive to another drive would do a copy. This does not hold true with iCloud. When a file is dragged from a local drive to an iCloud drive, it is moved and not copied. This change in behavior is dangerous, especially since many if not most MacOS users are not aware of this. Files moved to icloud will no longer be backed up. Files should always be in at least 2 places, preferably 3. I don’t know what all the angst is over iCloud Dive. I turned it on and all of my files are available to me on all my devices (the devices I chose to have this capability). You don’t have to “do” anything. Just use your computer and all your files will be available anywhere you choose. That’s the problem with Apple – it’s designed to just work and people aren’t used to just letting things work. They think they have to manage everything. You don’t. Your data is safe and accessible automatically. You don’t have to “do” anything more. Just USE your Apple devices and move on with life. I just want to know how I can see exactly which file is not uploading. I have so many files stored in iCloud, 48gb worth, yet my computer is always stuck on some mysterious 136kb file that won’t upload! so frustrating.